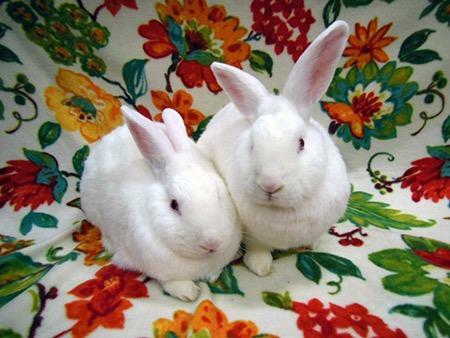 Rabbit Haven's ultimate goal is the permanent placement of our rabbits in safe, loving indoor homes. Adoption counseling, visitation, and education services are provided to the public at adoption events held three times each month. 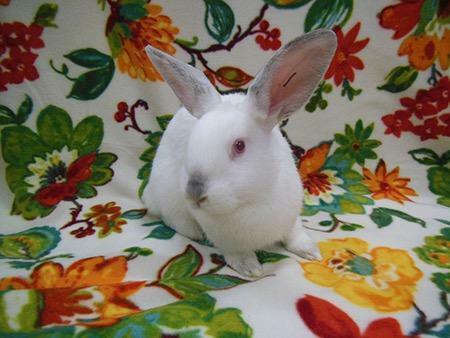 We are 100% foster based, therefore, our rabbits may be seen at these shows at Pet Pals (Santa Cruz) or at For Other Living Things (Sunnyvale). See schedule of show dates below. 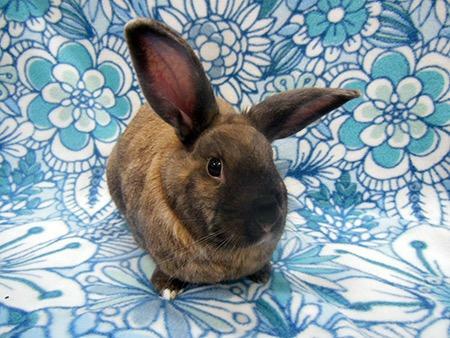 We are happy to work with you to help you by making a special appointment for you to meet with rabbits of your choice at one of our adoption shows. We require that all rabbit caretakers provide permanent homes, a safe environment, proper food, grooming, medical attention, and the love and support essential to the rabbit's well-being. 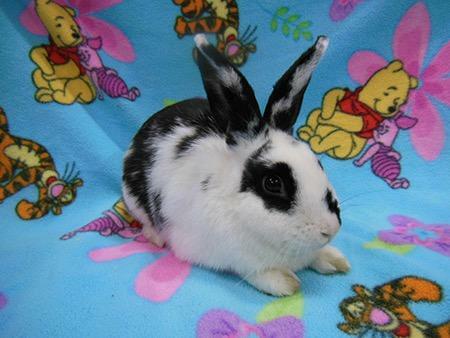 Rabbit Haven only adopts to families who agree to keep rabbits indoors. Outside arrangements are not possible due to exposure to the elements, inadequate contact with their families, exposure to disease agents, such as the very deadly Myxomatosis, and predators that will harm the rabbit. All new adoptive families receive personal adoption assistance from a Haven counselor, a free first vet exam, discount coupons from area pet supply retailers, a complete rabbit care education packet, rabbit nail trims, and a home heath check demonstration. 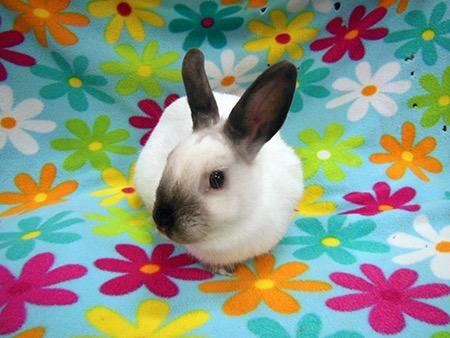 Below you can find information about the bunnies available for adoption. 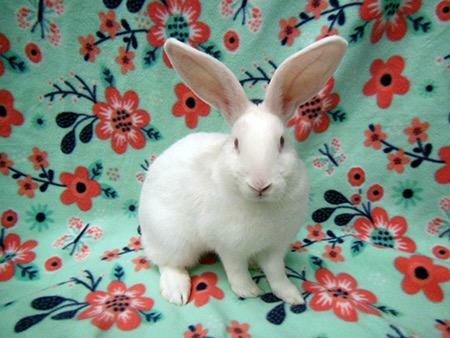 Special services of the Rabbit Haven Adoption centers: Personal adoption appointments, Matchmaking, Bonding, Home health demonstrations, housing and set up training, referral to suppliers that have items you need for your rabbit, referral to pet sitters for your rabbits and Haven couselors who can anwer your questions regarding rabbits. 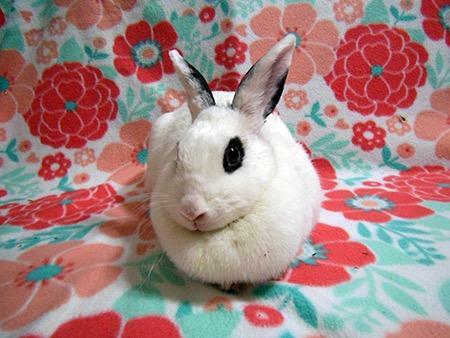 Have you adopted a rabbit from the Rabbit Haven? We would love to hear from you! Send your story and photos to director@therabbithaven.org. Post your adoption story and see what others have posted too! 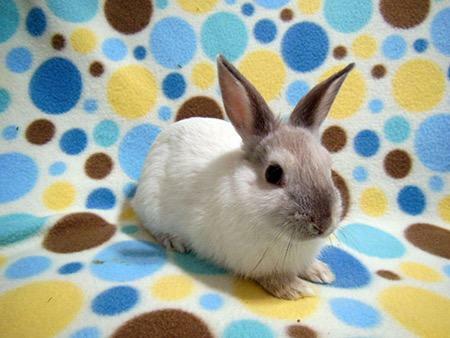 Take a look at our Facebook page for real time updates, wonderful videos and clips from our foster babies and bunnies. Click here. No need to have a facebook account to see! Welcome! Sedona is a wonderful sweet sable point lion head boy. He is neutered. Sedona likes to play and snuggle and lives in an x pen with a flannel sheet for his floor. He is using a litter box, good water dish and hay basket. So far he seems to enjoy toys and pets. Special grooming training comes with his adoption. Contact us to find out more and to set up an appointment to meet this rabbit. Hello everyone. I am a sable point, dwarf lion head. I am very young and weight only 1.5 pounds. I want a home where I will be loved forever. I want to live with fleece for my floor and lots of hay n greens. I am sweet, loving and looking for my home where I will be cherished forever. I eat alfalfa hay and baby pellets. I love to be held. I have long fur so I come with grooming instructions. I like being brushes so it is not difficult. Please talk with Heather about my needs. I sometime need to move my head from side to side to see better. But that is not a problem. Please do not trim my mane around my face! My fur is part of my amazing personality. Oh I wanted you to know that I use a litter box! I also drink from a water dish and eat pellets from a food dish. I need to be in a home without any predatory animals –they scare me. A 24” x pen is fine with me as I do not do high jumps. 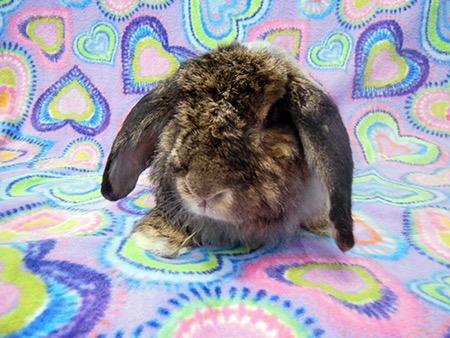 Savannah is a beautiful Holland Lop rabbit. Savanna is an adult. Birthday in June. She loves to eat Timothy Hay and pellets. She also loves fresh greens. Savannah can be very shy, yet with the right loving owner she will blossom. 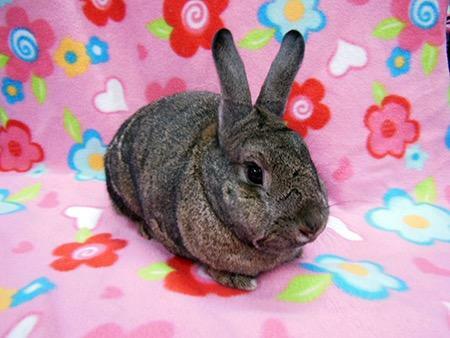 Savannah is spayed and is ready to meet her forever family! She will thrive with a family that will cuddle her and love her! A house without dogs would be ideal. Savannah drinks from a water dish and uses a litter box. She lives in a 4 X 4 x pen with fleece flooring. Savannah can be defensive at first, but will then enjoy snuggling and cuddling you once she feels safe and secure. 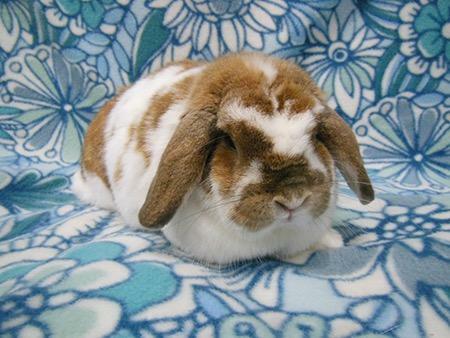 Toffee is a gorgeous Holland Lop rabbit. He is a mature adult. He loves Timothy Hay and Adult pellets. He enjoys fresh leafy greens. 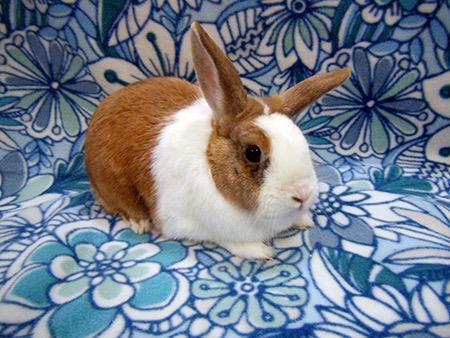 Toffee loves to snuggle and is quite affectionate. 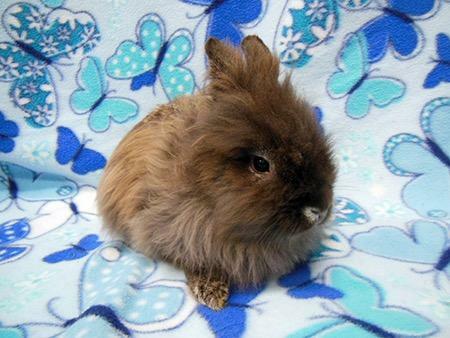 Toffee is neutered and a calm and sweet boy! He would enjoy living with a loving family. Toffee uses food / water bowls and a litter box. He is very curious, friendly and happy rabbit! Prefer x pen living with Fleece as his flooring. He is lovable and cuddly. Prefers no predatory animals please. 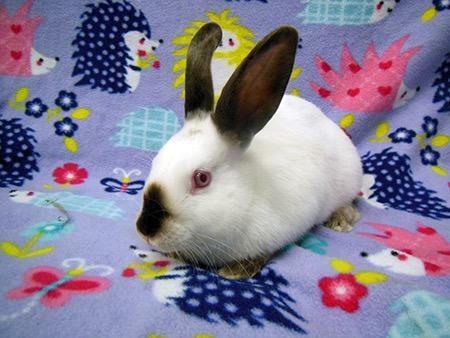 Sweet, loving Hotot baby bunny needs a loving sweet home. 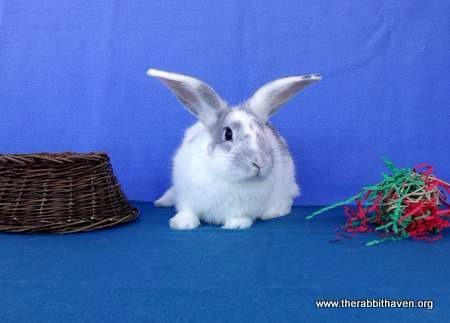 Daphne loves attention, alfalfa hay, toys and playtime. She lives in a clean x pen with Fleece for her flooring. She uses a litter box and food water dish. She is just adorable. Brownie is a sweet Rex boy. He was born 11-2018. He is med size and super loving. Brownie lives in an x pen and is also allowed to free roam. He uses a litter box, good water dishes and eat high quality fresh pellets, hay and greens. He loves toys and lots of human interaction. He will be available;e once he is neutered. Lauren is a beautiful and sweet spayed female. She is joyful and loving. She wants to live in an x pen 4 x 4 or more and uses fleece under her feet. Lauren uses a litter box, food water dishes and a big hay basket. She love chew toys, balls that roll and people to keep her company. Her even temperament will make for an awesome addition to a loving home and family. Lauren eats fresh greens, lots of hay and fresh water every day! 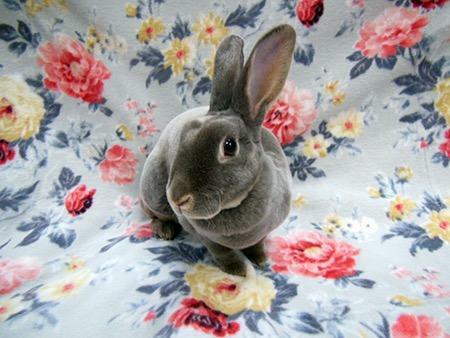 Chloe is a delightful, gray min rex female. She is sweet , loving and lives in an x pen with flannel or fleece as her flooring. Or she may be free roam – She is spayed and healthy. Chole loves toys, great company and she eats western timothy hay, fresh clean pellets and fresh leafy greens especially cilantro and parsley. 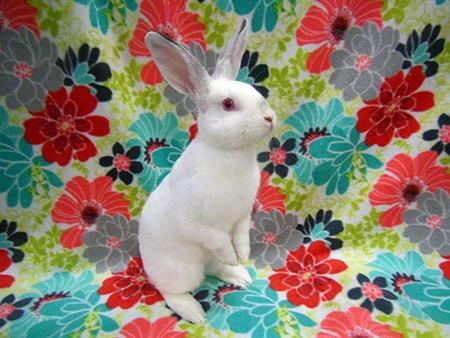 She is thinking that she may want a bunny friend – Not required – but possible. What a sweetheart. more information about these two rabbits coming soon. 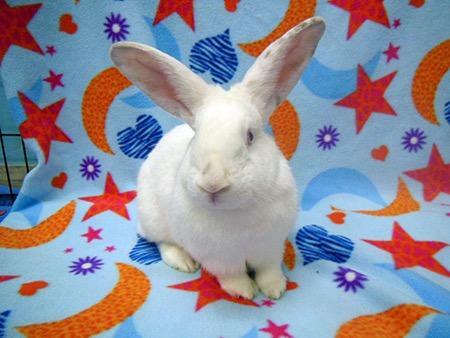 Hello my name is Ethan and I am a lovable bunny boy – I live in an x pen with a condo attached. I use a litter box, food water dishes and a veggie plate. I love toys and romping space. I love my humans and want to be close to them. I like the sound of a happy family- videos and music. I am an active bunny. I love my hays and greens. See you soon! I am a gorgeous rex mix female- I have lovely gray marking too! I am spayed, happy and want a loving indoor home. I live in an x pen with Flannel or fleece under my feet. I eat dandelion greens, kale and other dark leafy greens plus Clean adult pellets and fresh western timothy or orchard grass hay,. I like tents and tunnels and all things to play with. I need a minimum of 4 X 4 space. Look forward to meeting you . 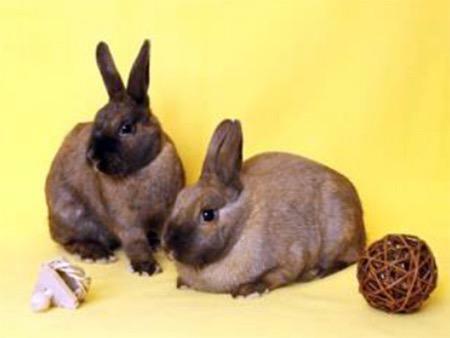 Milo and Lola are charming Netherland dwarf bunnies – They are spayed and neutered and make a great pair of houserabbits- They eat western timothy and orchard grass hay, light pellets and greens. They live in an x pen and use litter box, food water dishes and nice hay basket. They love affection and playtime. 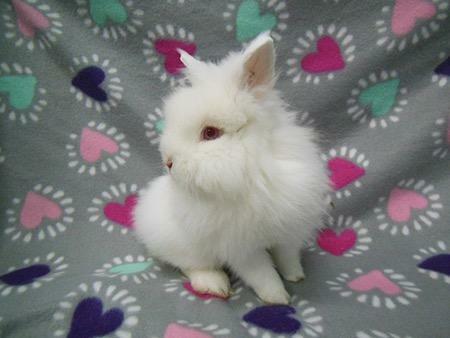 Teah is a French angora. She has been spayed and she is in good health. She was born in 2017. She’s such a cuddly, wonderful and social rabbit. She loves to romp and play and requires daily grooming to keep her beautiful fur perfect. She is ok with cats. No dogs please –She might enjoy a bunny companion. She lives in an x pen with fleece for her flooring. She uses a litter box and food water dishes. Compatible with large or small family – Loves handling, toys and playtime. Seems to enjoy most any toys she can roll or toss. 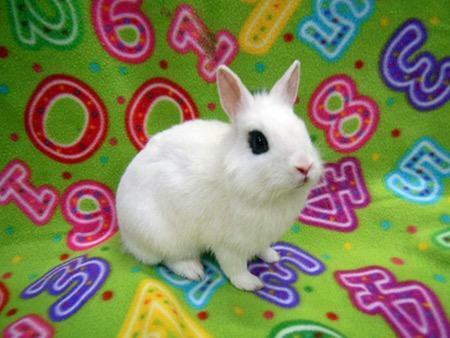 Kimchi formerly Magellan, is a 10 month old hotot male (see photo). He's neutered and VERY good at using his litterbox. He is very food motivated. His favorite treats are bananas and dinosaur kale. He goes absolutely nuts for greens, and I have yet to find greens he doesn't like. He isn't a jumper, so a short X-pen is more than fine. He likes chewing on toys, and binkying around the house. He is very very sweet. Kimchi isn't a huge fan of being picked up, and prefers to sit next to you for pets and cuddles. He eats Sherwood adult pellets and Western Timothy and Orchard Grass hay. Kida and Kimchi have started their bonding process and have shown signs of liking each other. They'll sit smushed against each other while one is free and the other in their xpen. They take naps that way, and groom each other through the bars. 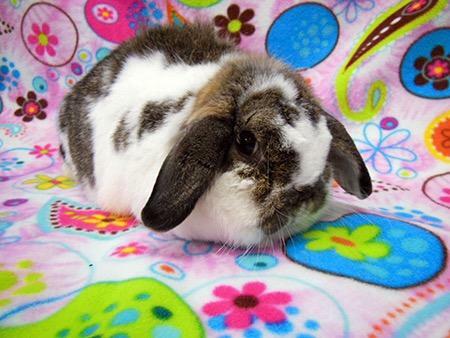 Kida is a year old lovely holland lop. She was recently spayed, and is getting better at using her litter box everyday. She is very sweet, and will frequently come up to check on you for attention and pets when she sees her humans. She eats Sherwood adult pellets and Western Timothy hay. She likes all greens except chard, and loves strawberries and bananas. Kida likes being picked up, and loves cuddles and pets on her terms. She is a very sassy opinionated girl. 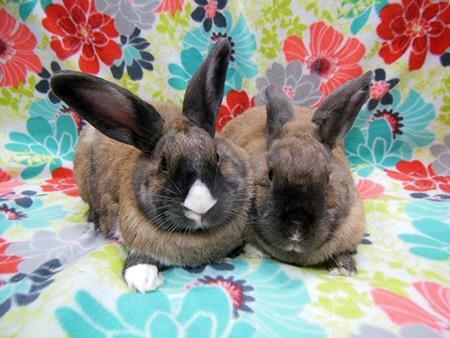 Kimchi and Kida are available for adoption as singles and possibly as a pair. 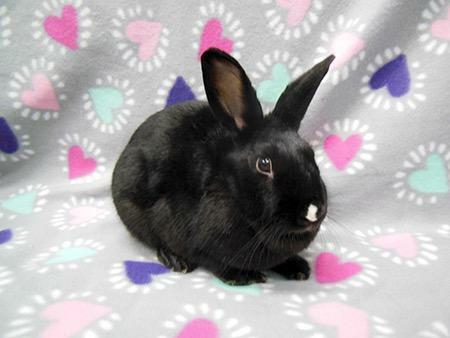 Kalinda is a sweet and gentle bunny. She loves to adventure and to be held. She eat primarily baby pellets and lot of alfalfa hay. She is using a litter box and food water dishes. She lives in an x pen with fleece for her flooring. This charmer is darling and loves affection. Enjoys playing with tunnels and toys to roll or toss. Melinda is a joyful girl She is calm, loves holding and affection. She lives in a x pen with Fleece flooring. They eat primarily Sherwood baby pellets and lots of alfalfa hay. They are using their litter box . She loves to play with her tunnels and toys. Melinda is very smart and curious. She uses a food and water dish. Kazumi, born 11/7/2016 is a delightful spayed girl. She has a beautiful dark agouti fur and the sweetest face. Kazumi lives in a big x-pen with fleece for her flooring. She carefully uses her litter box. 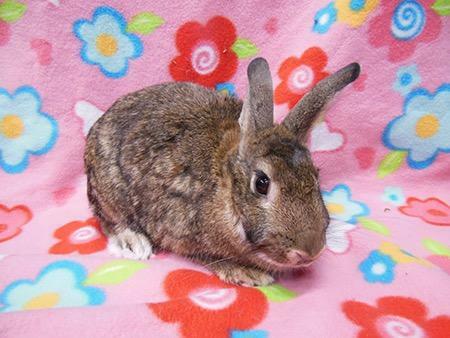 Kazumi loves to race about and do binkies and to run through tunnels to keep herself entertained. She is so affectionate and loving too! Amais is a sweet bunny. Her is a white lion head with a precious temperament. He uses a litter box and food water dishes and lives in a 4 x 4 X pen –He loves begin held and to have lots of attention. He appreciates the companion ship of other humans. Amais is smaller about 2.4 pounds. He is a perfect joy. Hi, I’m called Sparkles, that is due to my lively personality. I’m a very pretty, black, 5.5# spayed female. I was recently rescued from living outside. I’m happy that I am safe and dry now. I hope to find my forever home where I can live inside with my family No more out of doors for me! I can be a bit shy when I first meet you, but once I get use to you, I’m pretty good. I love pets. I live in an x pen and eat Timothy hay, pellets, and various greens. I like toys and more than anything I am looking for love. Make my valentine’s day special and adopt Me! Hi, I am Liisu, daughter of ginger. My siblings and I were born in a busy parking lot, but some nice people took us in and gave us a place to live safe from cars. As you can see, I am gray white color, & adorable, with soft fur. I am looking for a home of my own where I can be loved by my forever family. I live in a spacious x pen with a flannel sheet as my flooring. I currently live with my sister. I use a litter box very well and a food a water dish. I love toys and to hang out with my family. Please come in to meet me. Hi, I am Elli. Daughter of Ginger. My mom and my whole family were abandoned out side on the street. It was very scary because we didn't have anyone to give us hay or water and there was no shelter or safety from other animals. Our mother struggled so much just to keep all of us safe. One day a special perons found us, and brought us to the Haven. I now live in a big x-pen with my own litter box and food water dishes and hay basket. I feel so special - I love being petted & snuggled. I love chewing on my willow ball or tossing it in play. I am looking for a forever home with my very own family. I want someone who wants to hold me & care for me. 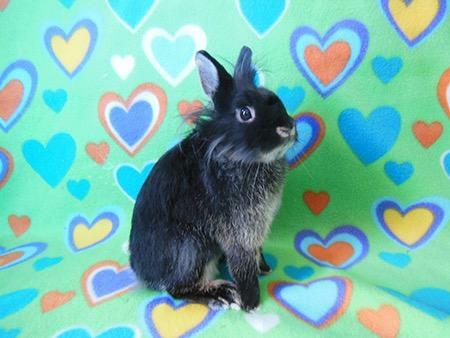 I am a very sweet bunny who just wants to be loved! Please come to see me soon. Ps: I am spayed and healthy. Noeleen was rescued from a local shelter after she had her babies. Many shelters ask for rescue when mother bunnies have a litter. We were happy to help. Her sister was also rescued just two days before after giving birth. Sadly, her sister passed away the day Noeleen was rescued. Noeleen, with 3 kits of her own, without question, adopted her sister’s kits as her own. Noeleen cared for and nursed the others to be healthy and fun Loving Rabbits. 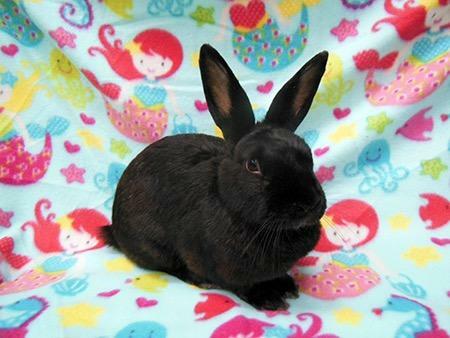 Noeleen is a very sweet, calm bunny. She wants to give and receive love. She likes to flop down and relax. She is a great mother bunny. She had a very difficult life growing up as a "breeder" bunny. 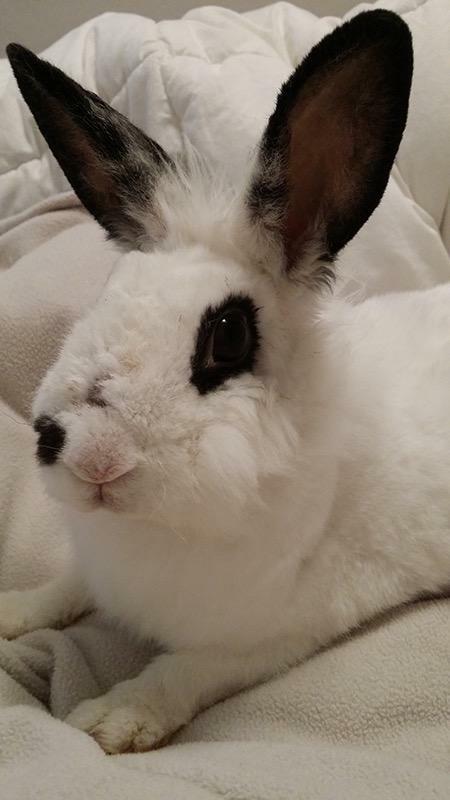 Regardless, she was a loving bunny and a wonderful companion bunny. She is so sweet. She is looking for a caring forever, loving home of her own. Joy is impish and full of fun. She likes to hang out with her sister Merrily. Joy is curious and loves to play in tunnels and with just about any toy she can find. She currently lives in an x pen with fleece for her flooring and she uses a food and water dish as well as a litter box! This rabbit eats unlimited alfalfa hay and baby pellets plus fresh water sand some greens. She will want a kind family that will love her forever. 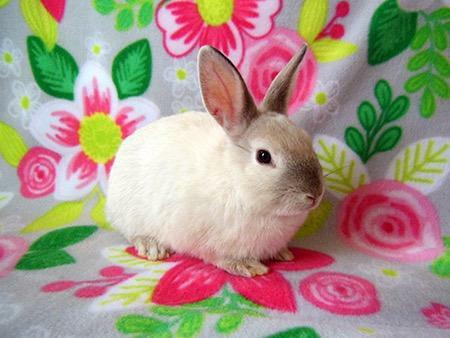 Please ask staff for our baby care packet when you come in to meet /adopt this rabbit. This bunny is delicate and super sweet. Wish is so very gentle and wants to be loved. She adores attention and toys. 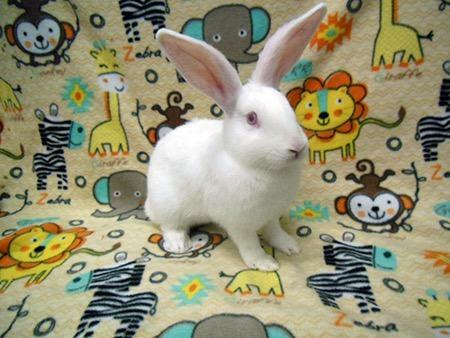 She promises to be a wonderful rabbit companion for a loving, gentle family – Please pick up your baby care handout at the show. Our staff will be happy to tell you all about her bunny needs. She currently lives in an x pen with fleece for her flooring and she uses a low food and water dish as well as a litter box! Such a smart bunny! This rabbit eats unlimited alfalfa hay and baby pellets plus fresh water sand some greens. 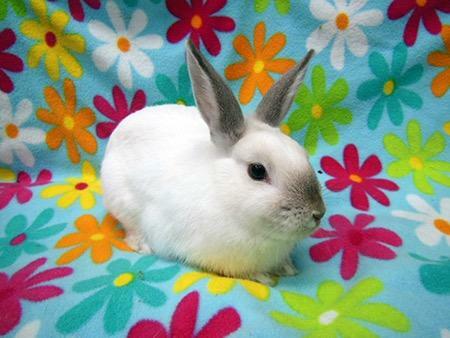 SugarPlum is a very small, delicate bunny girl. She is affectionate, charming and is a special little one. She lives with her sisters and mother right now and will not be avail until March 2019 for adoption. 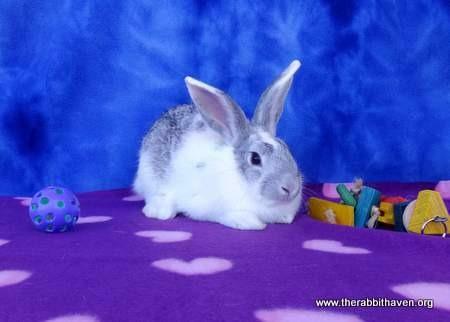 Sugarplum lives in a baby x pen with fleece for her flooring and uses a litter box, and very low food and water dishes. She love to be held and to play in equal measure. She eats unlimited alfalfa hay and baby pellets plus fresh water sand some greens. she is seeking a special home where her unique characteristic will be appreciated. Pure love! 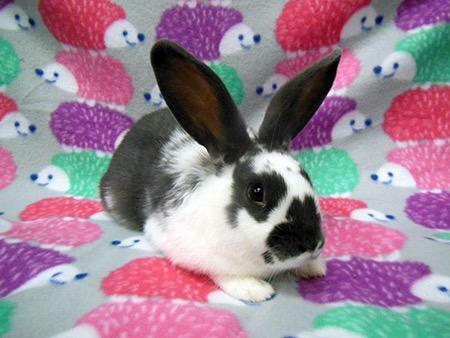 Jolly is a petite, calm, yet playful little girl. 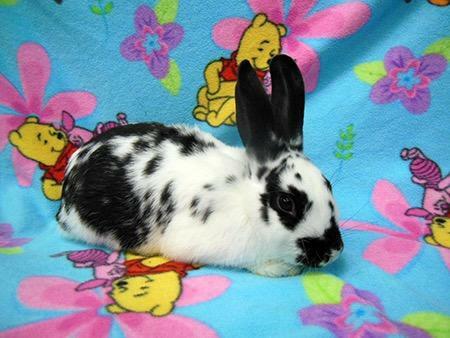 She is very small for her age and will appreciate a loving sensitive family who will cherish her forever. She is doing well with her sister Jingle. They may be a good pair. She currently lives in an x pen with fleece for her flooring and she uses a food and water dish as well as a litter box! Plus she loves her hay basket! This rabbit eats unlimited alfalfa hay and baby pellets plus fresh water sand some greens. Please pick up our baby care packet when you come in. Staff will also go over all her needs in your adoption apt. Irresistible. 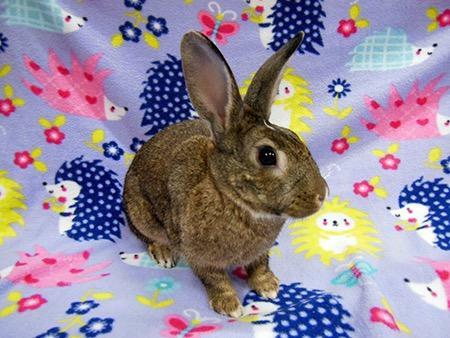 Whisper is a charming, very young bunny who is curious about her environment and happy she has a very safe place to live. She is a very lucky bunny! Her 8 kits were rescued and turned into a local shelter. Her kits were just 2.5 weeks young. We were able to contact the person who found the kits and help him locate the mother. We went the next day and we were able to reunite Whisper with her 8 kits. Everyone was so happy! Then loving Whisper took in yet another -She later adopted and nursed an orphan named Wonder. Whisper is a very gentle and kind rabbit. She likes to relax and enjoy watching her kits. She is not too active and will relax after play time. She was on the streets and can be frightened if things appear above her head. She would hop away out of fear. She is a very loving and kind Mother to her babies and watches over and protects them. She currently lives in an x pen with fleece under her feet. She uses a litter box and food water dish. She is eating alfalfa and timothy hay and plenty of fresh leafy greens. Dasher is a young girl born November 26, 2018. This baby girl and all her siblings are weaned and happily living in a fleece lined x pen. They enjoy alfalfa hay, Sherwood alfalfa pellets and fresh water is a low dish.. They are accustomed to fleece as their flooring and all use a litter box and a large hay basket. They love all sorts of toys and play with, in and on. They love willow balls and tunnels. Check them out on the Rabbit Haven Facebook website! Special training offered with any baby adoption. Ask our staff for their special care handout. Just started greens. special care handout. Super cute and affectionate! Prancer is a young boy born November 26, 2018. This baby and all his siblings are weaned and happily living in a fleece lined x pen. They enjoy alfalfa hay, Sherwood alfalfa pellets and fresh water is a low dish.. They are accustomed to fleece as their flooring and all use a litter box and a large hay basket. They love all sorts of toys and play with, in and on. They love willow balls and tunnels. Check them out on the Rabbit Haven Facebook website! Special training offered with any baby adoption. Ask our staff for their special care handout. Just started greens. special care handout. Always on the lookout for someone to play with! Dancer is a young girl born November 26, 2018. This baby girl and all her siblings are weaned and happily living in a fleece lined x pen. They enjoy alfalfa hay, Sherwood alfalfa pellets and fresh water is a low dish.. They are accustomed to fleece as their flooring and all use a litter box and a large hay basket. They love all sorts of toys and play with, in and on. They love willow balls and tunnels. Check them out on the Rabbit Haven Facebook website! Special training offered with any baby adoption. Ask our staff for their special care handout. Just started greens. special care handout. Loves to play! 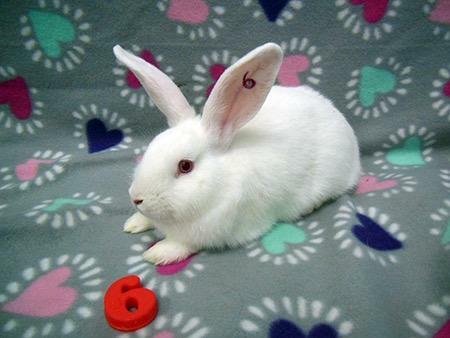 Walker is a young male bunny born November 26, 2018. This baby and all his siblings are weaned and happily livening in s fleece lined x pen. They enjoy alfalfa hay, Sherwood alfalfa pellets and fresh water is a low dish.. They are accustomed to fleece as their flooring and all use a litter box and a large hay basket. They love all sorts of toys and play with, in and on. They love willow balls and tunnels. Check them out on the Rabbit Haven Facebook website! Special training offered with any baby adoption. Ask our staff for their special care handout. May want to have a companion later. Dreamer is a young girl born November 26, 2018. This baby girl and all her siblings are weaned and happily living in a fleece lined x pen. They enjoy alfalfa hay, Sherwood alfalfa pellets and fresh water is a low dish.. They are accustomed to fleece as their flooring and all use a litter box and a large hay basket. They love all sorts of toys and play with, in and on. They love willow balls and tunnels. Check them out on the Rabbit Haven Facebook website! Special training offered with any baby adoption. Ask our staff for their special care handout. Just started greens. special care handout. Shy and darling. Hopper is a young boy born November 26, 2018. This baby and all his siblings are weaned and happily living in a fleece lined x pen. They enjoy alfalfa hay, Sherwood alfalfa pellets and fresh water is a low dish.. They are accustomed to fleece as their flooring and all use a litter box and a large hay basket. They love all sorts of toys and play with, in and on. They love willow balls and tunnels. Check them out on the Rabbit Haven Facebook website! Special training offered with any baby adoption. Ask our staff for their special care handout. Just started greens. special care handout. Sleepy little boy. Racer is a young boy born November 26, 2018. This baby and all his siblings are weaned and happily living in a fleece lined x pen. They enjoy alfalfa hay, Sherwood alfalfa pellets and fresh water is a low dish.. They are accustomed to fleece as their flooring and all use a litter box and a large hay basket. They love all sorts of toys and play with, in and on. They love willow balls and tunnels. Check them out on the Rabbit Haven Facebook website! Special training offered with any baby adoption. Ask our staff for their special care handout. Just started greens. special care handout. Amazing little boy. Hi! I’m Cooper. 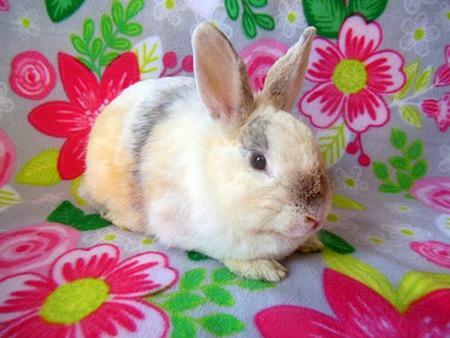 I’m a young (born 12/2017) neutered male rabbit. Did you notice the really cool black stripe on my side? I call it my racing stripe because I’m very fast when I run around! I am a sweet, fun and active boy. I love to explore and I will binky to your heart’s delight if I have lots of space. When I’m not exercising, I like to sit by your side and be petted. As for my private living quarters, a 4’ x 4’ pen complete with rabbit toys (willow balls, rattles and organic pine cones) and a hidey house would be SO great! My littter box should be filled with a variety of tasty, fresh hay like timothy, orchard grass and botanical. I also like to eat small amounts of fresh greens daily like parsley, cilantro, kale, red or romaine lettuces, dandelion greens and basil. Perhaps, on special occasions, a small piece of fruit like banana, apple or strawberry would be nice. Careful though, just like humans, I can’t have too much sugar.​ Please consider me if you are looking for your best bunny friend. Thanks! Arias is about 2 -3 yrs old and had babies about 5 months ago. 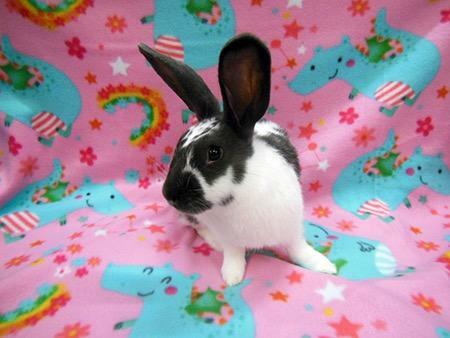 She is spayed and wonderful and such a super sweet bunny. She lives in an x pen with soft sheets for her floor. She is delighted by toys and attention. Love to eat fresh veggies,, hay and pellets – Loves dandelions. This lovely girl is a gem- come to meet her soon. This young male is neutered and an absolute sweetheart! Born Sept 2018. Media likes affection and romping and play. Tunnels a great- wicker tents fun too. 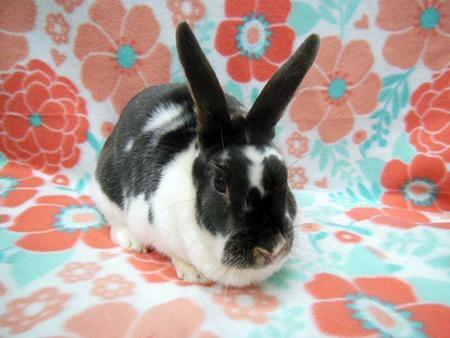 He enjoys alfalfa hay, Sherwood young rabbit pellets and fresh water –He eats fresh leafy greens such as dandelion greens, parsley, red leafy ,lettuce and kale. Media lives in an 8 panel baby x pen with a flannel sheet as his . Of course, he is litter box trained. Media likes his large hay basket and his wicker toys. What a fun loving rabbit! Beautiful too. He is a healthy happy boy. Cianna is ana active playful and adventurous girl! She was born in June 2018 and was recently rescued from a shelter. She is a bit feisty so best for an adult family or a family who can appreciate her antics. She lives in a 30” x pen. She uses a litter box, food water dishes and hay baskets . She Loves Hay! Cianna enjoys lots of wicker and chew toys- she communicates using her mouth and bumps you for pets or to get your attention. 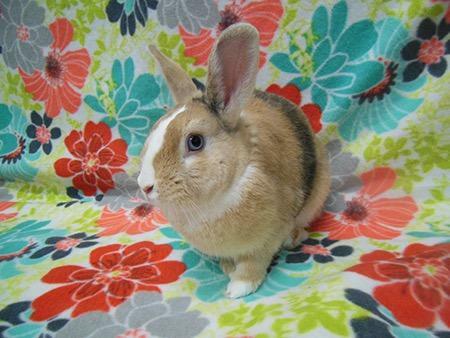 Come to meet this beautiful Dutch bunny soon. Darby is are calm and super charming. Darby is a tiny cuddly boy and sweet as he can be. He enjoys spending time with his litter mates, especially Moki. He is playful, fun loving and enjoys his alfalfa hay and pellets. He lives in a fleece lined x pen and play in tunnels, and cardboard condos. He loves wicker and hard plastic balls and any new area he can explore. Come to meet Darby soon. What a sweet bunny he is. This charming young boy is delightful and happy! He likes his brother and they can spend hours playing peacefully – He is a boy and not yet neutered as he is not ready yet. Herschel comes with special care handout and info on his history and birth date. Expressive and sweet! HI my name is Moki! I am a loving boy who appreciates cuddle time and kisses. I play with my brother Darby and like to run through tunnels and climb up in the cotton tail cottages our foster family has . sometimes Darby and I play doing binkies…high jumps on the air. We even got to go into a little castle once! I like toys and adventure and live in a soft fleece lined x pen. I use a litter box food water dishes and a hay basket. I am small now but will be bigger when I grow up. Please come to meet me soon. Renton: Hello everyone my name is Renton! I am tiny and a very happy boy! I have soft gray ears and nose and I like people and other bunnies. I am super playful and outgoing. I like to adventure and discover new things. Hopping into cotton tail cottages or running through cardboard tunnels are a few of my favorite things. Oh I do amazing binkies –watch me jump. Of course I use a litter box, food water dishes and I am eating alfalfa hay and baby Sherwood pellets. I love all sorts of toys- Surprise me . 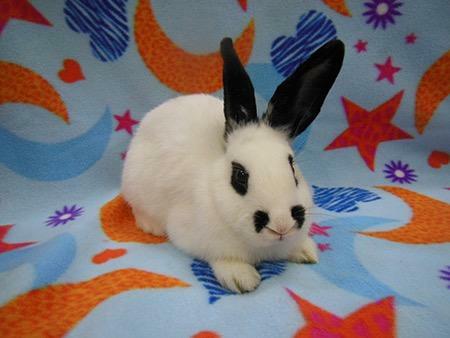 Toby aka Lemon is a charming jet black and white neutered Hotot male rabbit who loves to explore his world! He has a really nice demeanor about him. He would appreciate a forever home with older children or adults in a larger indoor xpen environment or free roam arrangement with lots of Timothy hay and fresh greens. This lovely bunny was rescued from a local shelter after she gave birth to 7 kits. Sadly only one boy made it. He was named superbunny. Tesha is medium sized and has a wonderful, sweet temperament. Tesha is a very clam and gentle rabbit. She helped nurse a kit in need from Fawna's litter. She became a God Mother of Tomoko. They became known as "Baby and Friend" on the Rabbit Haven Facebook. She later became God Mother to the rest of Fawna's kits. Tesha took over the care of Fawna’s kits when Fawna had an unexpected back to back litter! 6 new babies. What a special bunny! Tesha will be spayed in December and then will be avail for adoption. She lives in an x pen setting with soft fleece as her flooring. She eats timothy and orchard grass hay and Sherwood pellets. She uses a litter box and food water dishes and enjoy a brimming hay basket. Superboy is the son of Tesha. He was hours from passing away when Tesha's milk started to be produced. We were so worried and just about ready to tube feed him. Sadly, Superboy lost 6 of his brothers and sisters. Once his mom was well she added another kit from Fawna’s litter. She was so tiny and Superboy stayed very close to her and kept her company. The companionship they formed most likely helped them both survive. Superboy became best friends with his new litter mate. They became known as Baby and Friend. Superboy is very social as he has been handled most of the time, plus he has had Friend and playmates from another litter. 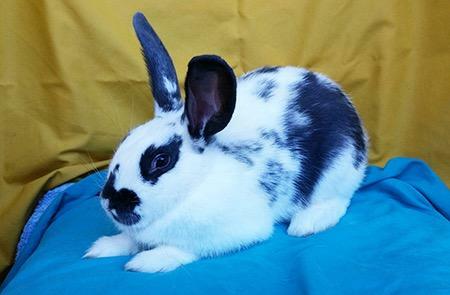 He loves to hop and run through his tunnels.. For now Superboy wants a loving home where he can be held and cuddled and have loads of time to romp and play. A x pen with fleece on the ground will be perfect. He already uses a litter box, food water dishes and a hay basket. He eats baby Sherwood pellets and alfalfa hay. He has started eating greens as well. He is simply adorable. He is now neutered. Contact us to make arrangements to meet Superboy. 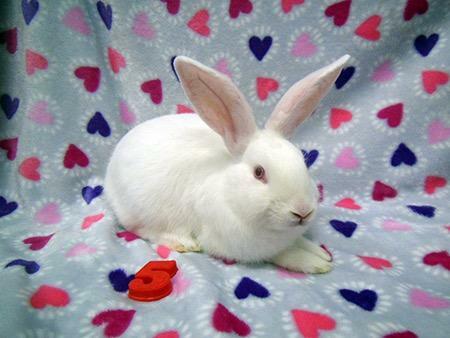 Shayna- Lovely young female. Recently rescued from shelter – Shayna loves her x pen and uses a food water dish and litter box. What a sweetheart. Shayna loves toys, tents, hay and food! She is filling in nicely and is Adorable!! She is a vocal bunny girl. 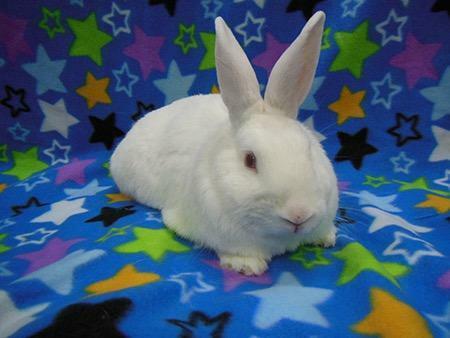 Kevin is a gentle, loving bunny who has been through a lot. He was rescued from an area shelter as they declared he was not adoptable. (imagine that) His ears are tattered and he was underweight and sad when he came in – He is improving now and is doing so well in his new foster home. 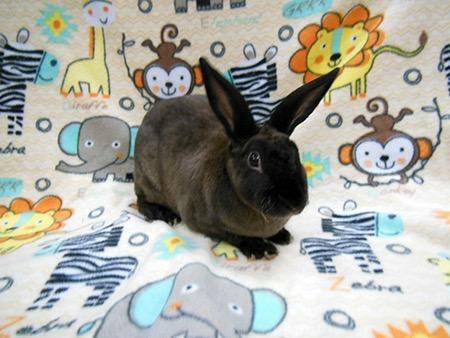 He lives in a wonderful x pen with adorable play areas and lots of love. That is just what he needed. He has made a full recovery – He uses his litter box and eats fresh yummy hay and greens –He is such a good boy. Silkey is a little charmer. This sweet rabbit is happy and fun. She loves to play with most any toy and needs lots of activities to keep her happy and active. She lives in an x-pen with soft fleece under her feet. She uses a litter box a large hay basket and food/ water dishes. She also loves being held and snuggled. She eats western timothy and orchard grass hay, good quality adult rabbit pellets and about 2-4 cups of dark leafy greens every day! She is a healthy beautiful girl. Silkey is spayed. She is lovely in every way- come to meet this special girl soon. enjoys begin out doing full runs and jumps –He is quite athletic. Mikei enjoys his willow balls, and likes to toss the big plastic toy balls around. 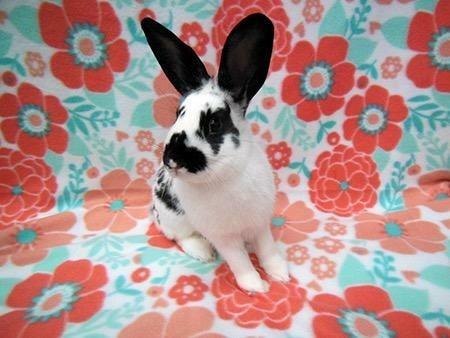 He is an incredibly interesting rabbit – He will be someone’s awesome companion. He really wants a permanent, bunny savvy family asap. 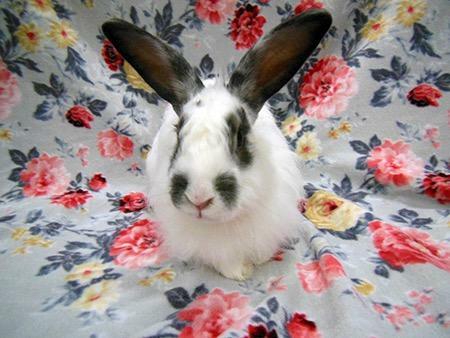 This lovely and very small Hotot girl is delightful and looking for a loving home soon. She lives indoors in an x pen setting and uses a litter box, food water dishes and hay basket. She loves fleece and likes a lot of affection. 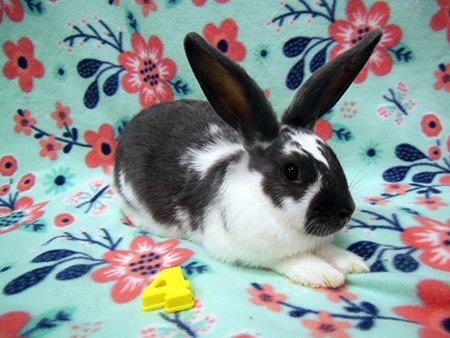 She is a very young adult female rabbit. Sweet personality. She eats Fresh greens and quality pellets along with unlimited hay. Simone this in the first daughter of Gwyneth. Very young and healthy. She is playful, curious dappled with a bit of caution. She wants to know exactly who is in her space. Who is coming to pet her etc. Smart bunny. She eats Fresh greens and quality pellets along with unlimited hay. She likes to have fun too…running about and doing great binkies. Lives in an x pen with fleece for her flooring and has a wonderful cotton tail cottage to explore. Gwyneth- A small , Hotot. she is simply charming. Loves to stretch out and be happy in her nice indoor home with fleece as her floor in her cozy room. Uses a litter box food water dishes and a hay basket. 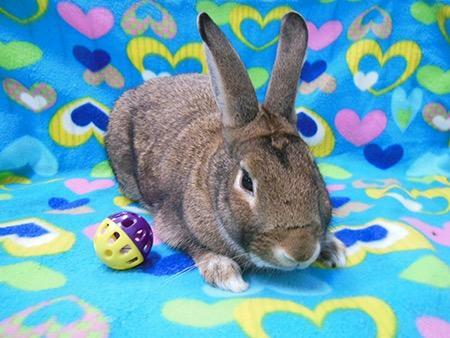 Likes attention and the freedom to play –enjoys toys of all kinds especially willow balls. She eats Fresh greens and quality pellets along with unlimited hay. Suri date of birth June 2018 female. Suri came to us after being abandoned in a box at an area shelter. 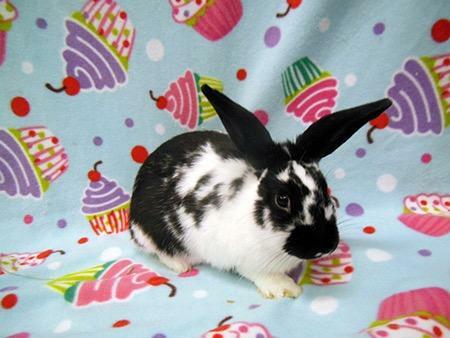 She is a wonderful bunny girl who loves toys, playtime, and snuggles. 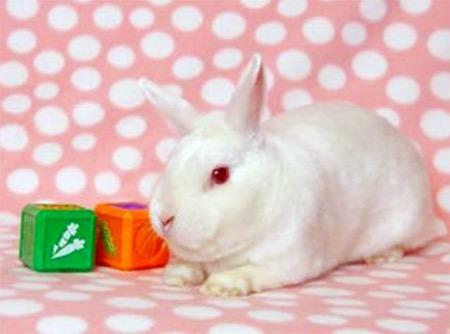 Suri is charming and active and will appreciate a family where she can be the center of attention. She eats Fresh leafy greens, limited pellets, lots of hay every day and plenty of fresh water. Sure lives in an x pen with fleece as her flooring. She has the most gorgeous markings. She loves wicker toys and her cuddle pod. Ask us about cuddle pods. Spayed. 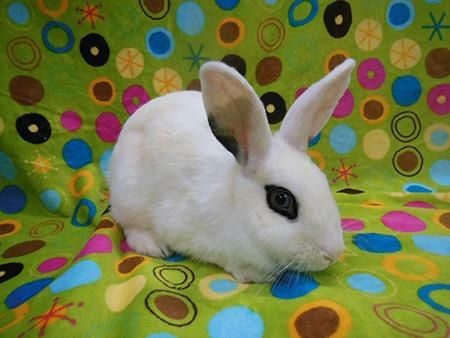 Kenny is a gentle & sweet rabbit. Primarily white with Gray on his ears, he is adorable. 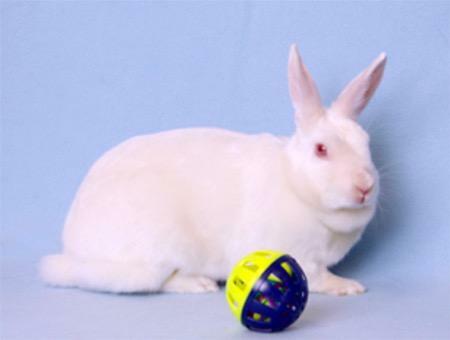 Kenny is playful, moderately active and good with children and adults. Kenny is about 4.5 pounds and does not seem to be growing further. He does not have an issue with most gentle dogs or cats. (No hunting dogs please)- Kenny uses a litter box, food water dishes and lives in an x pen with flannel or cotton sheets as his flooring. He enjoys fresh dark leafy greens, plenty of hay and food quality pellets. Kenny likes toys of all kinds and tunnel he can go through or a cottontail cottage to climb into. 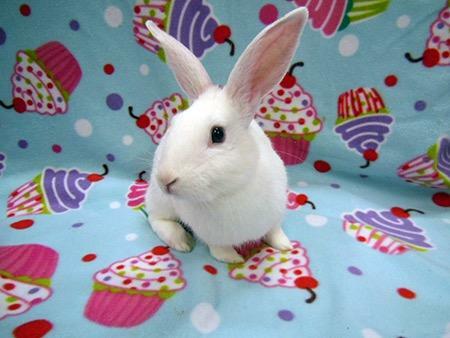 This amazing bunny is just waiting for a special loving family – Come to meet him soon. 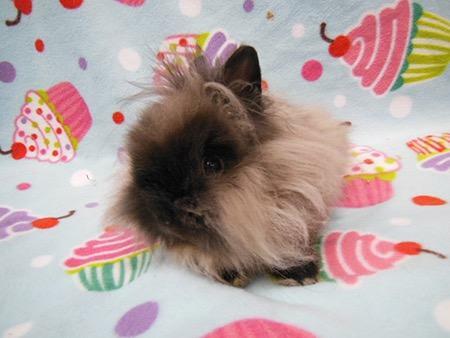 Puffy is a super tiny, delightful mane lion head. 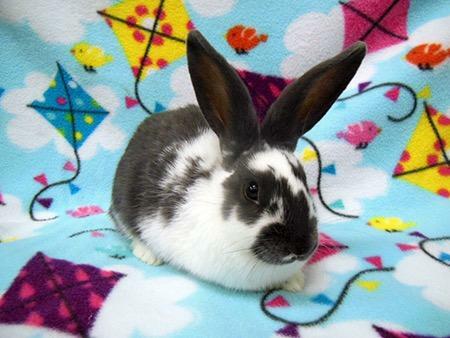 Puffy is a neutered, male bunny. Since he is so tiny we are recommending no dogs or cats in his environment. He will be best for gentle family with older children. Puffy uses his litter box and eats alfalfa hay and baby pellets. He loves to play and be held. What a beautiful boy! He loves wicker toys and tents and lots of room to live – minimum space 4 x 4 x pen – Fleece as his flooring. Excellent litter box skills. Cuteness with the kiss of an angel on her forehead. This darling girl, the daughter of Aria, is so gentle... yet playful. She lives in an x pen with a softer fleece floor. She plays in tunnels and loves Mrs. Hedgehog (More on that later) she has had many adventures since her travels from Las Vegas. Elara loves to be held, snuggle in her cuddle pod and play with her siblings. Charming bunny! Daughter of Sita, Cuddly, sweet and loving and Ananda, Shanti, Parvati and Rama are all sisters and they adore each other- Can be adopted as pairs or as a group! Amazing bunnies ! Litter box trained Can be spayed in March 2018. What beautiful girls -Live in an expanded x pen. Use food water dishes - Love cuddling. (Maybe two pairs?) Perfect for a family that wants lots of kisses. This Loving Mother and daughter could not bear to be separated so here they are. So wonderful and loving and snuggly. They are also happy and have the best time together yet they each have plenty of interest in their humans too. Love treats, toys, playtime. 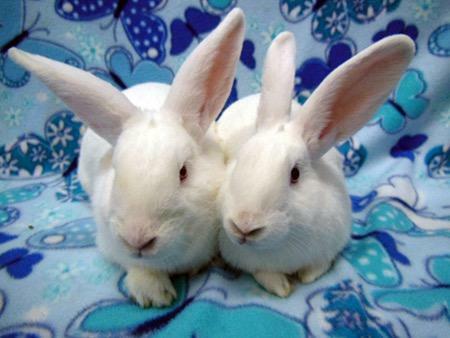 Live in an x pen (big) and use a litter box food and water dish – This delightful pair are spayed and perfectly healthy. Tya is Hiya’s Mom. 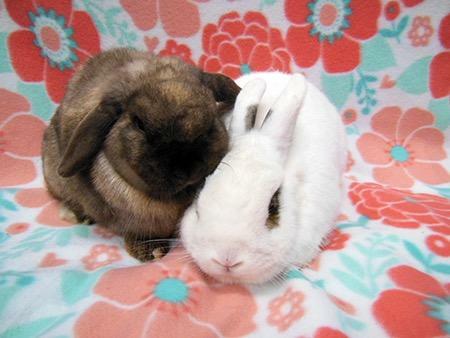 They are a beautiful bonded pair with soft brown fur - They are totally devoted to each other, never seem to have a disagreement, and have wonderfully unique personalities that mesh together perfectly. 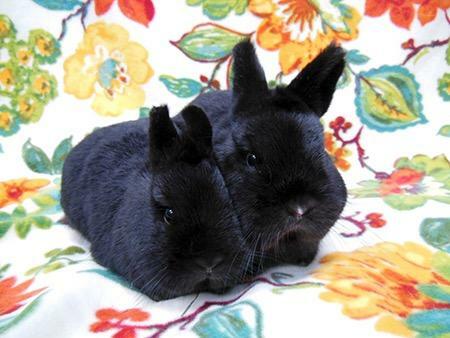 Tya and Hiya will make a lucky person or family a wonderful pair of pets. They always have each other’s back and are the best of friends, so they will never be alone when their humans are at work or school or out for the evening. They are fully litter box trained, love oat hay as their primary staple food. Snacks of Romaine lettuce and bunny pellets supplement their diet. Other than some oat hay getting tossed around a bit (they’re enthusiastic eaters! ), they keep a neat household. 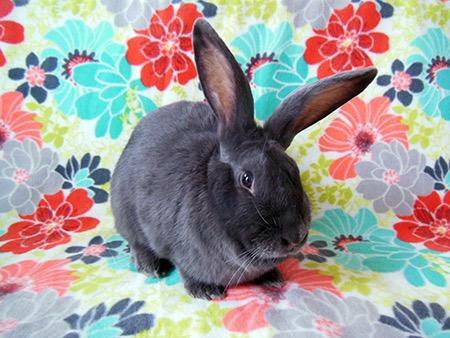 So consider adopting a Bunny-Hero Mother of the Year and her sweet daughter – they’ll fill your world with softness and fun. This darling pair of boys are happy and sweet. Born April 15, 2017, they are young boys. They are neutered of course. They love to romp and play and be with their human family. Their foster family says that these sweet brothers enjoy a long snuggle on your lap together. 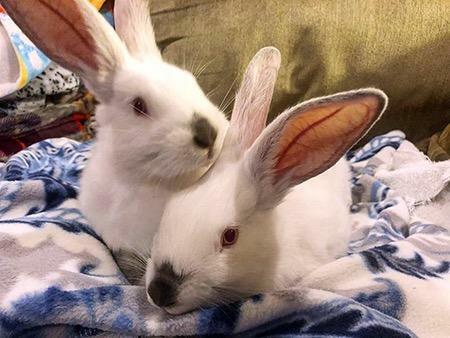 Put a soft blanket on your lap, add two buns, and presto, bunny snuggle happiness! Bonus is giving them a little green treat while they keep you company. They are content to play as a pair or with you as a single. They live in an x pen area and are great free roam bunnies too! They eat lot so hay every day and fresh leafy greens. They enjoy limited pellets as well. They use a litter box, food water dishes and a hay basket (a big one). They love toys so be prepared to visit the toy section at your favorite store! 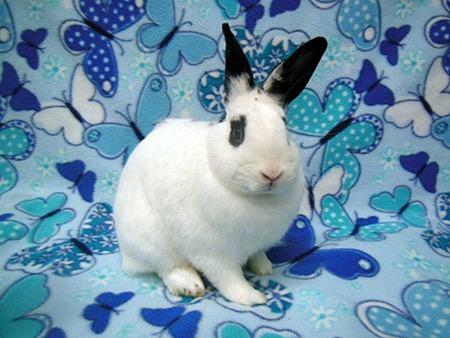 Loto is a charming adult rabbit. He is neutered. 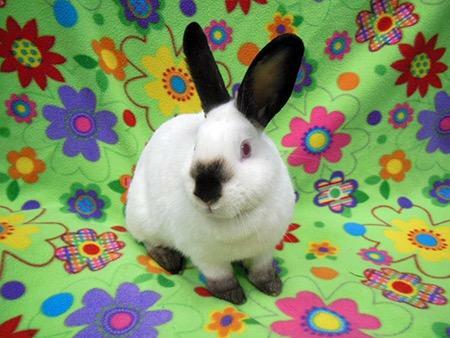 Loto enjoys the company of other rabbits and will benefit from a partner eventually. He is curious and friendly. Loto lives in an x pen (4 X 4) but enjoys free time outside his pen as well. he is ;litter box trained. Loto eats western timothy hay fresh adult pellets and greens. Come to meet this special boy soon. 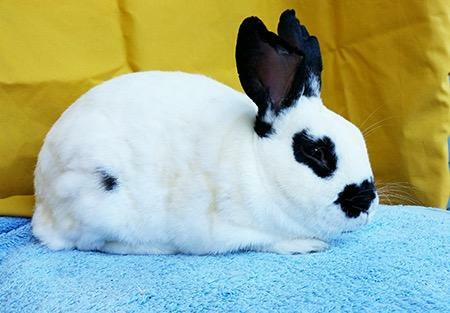 Helena is a rabbit that will fill your arms with her fluffy fur and your heart with love. She is playful and loves to romp around, especially in the morning. She has a calm disposition. She enjoys being petted and groomed. She is an angora rabbit so need daily grooming to keep her fur fluffy and healthy. Her feet seem ticklish so that takes a little practice to groom. She loves all veggies. Kale is her favorite dark leafy goody. She enjoys pellets and a small amount of hay in the morning (she eats a lot more hay at night). She lives in an x pen with a fleece floor AND a big litter box (she is a big bunny). She is so sweet. She is spayed and ready to meet her forever family. Come meet her. 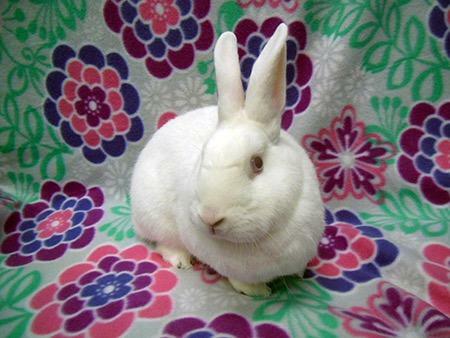 My name is Olive, and I am a pure white, neutered New Zealand rabbit. My disposition is gentle and kind, and because I am an mature rabbit, I am content to lounge throughout the day and daydream of wondrous dandelions and special treats! Although I eat primarily hay and pellets, I love to eat fresh dinosaur kale and a few blueberries. I prefer to live with a person who handles me in a gentle manner. I had a injury to my back long ago and that has completely healed but now I want extra care with my handling so that never happens again. . When I am adopted into a loving home, my plush animal friend Lambchop will be accompanying me. I live in an x pen with soft comfy fleece as my flooring. I use my litter box handily and I use a food and water dish. I love Sherwood pellets (adult) and lots of fresh timothy and orchard grass hay. No they are not bunnies but they are our friends and really needed out of the shelter.Visit the Cavy House website. We recommend care fresh litter for bedding and lots of hay they use both water bottles and bowls for water and love Cavy cuisine by Oxbow. See the Cavy Spirit web site for important information on guinea pigs.